In order to turn my weakness into a strength, I have resolved to buy and try more Italian wines. So far, I’ve had a few bottles. 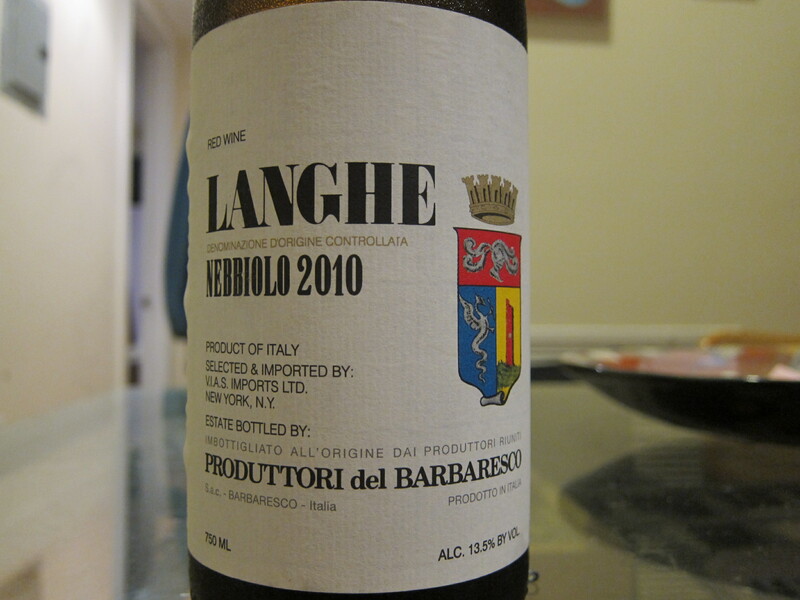 Of those, I am very happy to report that the 2010 Produttori del Barberesco Langhe Nebbiolo ($22.00 at Big Tree Bottles) was affordable and delicious! “Produttori del Barbaresco” refers to the fact that this wine is a product of the Cantina Sociale dei Produttori del Barbaresco, which is a growers’ collective located in Barbaresco. Langhe is actually a larger area which encompasses both Barbaresco and Barolo. A useful analogy is found in Burgundy: just as appellation-level Bourgogne is made of Pinot Noir that comes outside of specifically-demarcated appellations and vineyards (such as the “Les Charmes” vineyard in the appellation of Meursault), Langhe wine is made with the same grape as Barbaresco and Barolo but from a broader region. The practical consequence is that one may purchase a more easy-to-drink, approachable wine at a much lower cost than those from the more prestigious appellations. Nebbiolo, which some surmise was named after the heavy fogs (nebbia) that cover the Langhe during some of the harvest period, is a grape whose thick skins contain loads of tannin. The traditional method for making Barolo and Barbaresco leaves the skins in contact with the grape juice for extended periods of time, thus resulting in wines that require years of aging. Langhe-level Nebbiolo such as the one I drank for this post, on the other hand, does not undergo the same extended contact period nor the same long aging in barrel and is, therefore, meant for earlier consumption. The Produttori del Barbaresco Nebbiolo was a light ruby color, almost translucent. It was lighter even than some Beaujolais I’ve had. On the nose I detected sour cherry, cranberry, strawberry jam, and fresh red plum, notes which were confirmed by taste. This wine had moderate tannins which were held in check by a higher level of bright acidity. This was a beautiful, young, fresh wine with enough going on to keep me interested but delicious enough to make me drink quite a lot of it throughout the day. It went well with the meal of stewed pork ribs with rice and beans that I purchased from a local Puerto Rican joint. After this and some other Italian wines, I can’t say that I am appreciably more comfortable with the genre. However, if they are all as good as this one, I am eager continue learning. I wholeheartedly second the confusion with Italy but the unrelenting desire to drink and understand it, especially cherry beauties like the one you found. Good writeup! Thanks, Dano! They might be confusing, but they do produce some damn good wines. This is a good ‘producer’ – though you will find far more of the typicity of nebbiolo with their single vineyard barbarescos, which are also affordable for the quality. The lack of extended maceration on this wine makes it more like a juicy barbera than Nebbiolo proper. I’d recommend looking for Marchesi di Gresy Barbarescos as well – good value for superb quality. Of course, as you note it’s hard to fully appreciate these wines at less than 10 years of age. However, Chambers St. Wine has some old examples for very reasonable prices (~$50). It’s worth splurging to get a sense of what the grape becomes. Cheers! Excellent comment as always, Shea. I think I liked the Langhe because it was juicy, pretty complex, and went wonderfully with food. I WILL have to throw down for some decent aged Barbaresco or Barolo, however, and your recommendations shall not go unheeded!